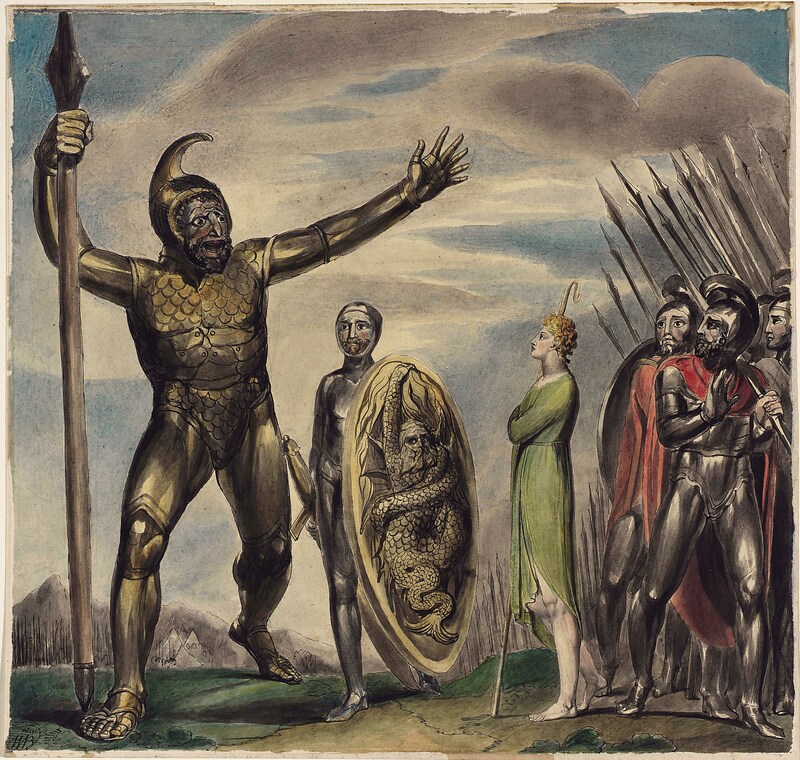 1 W. Blake, Goliath cursing David (I Samuel, 17: 41-43). Courtesy Museum of Fine Art, Boston, Gift of David Keppel, 1914.
oeuvre, of a Pulchinello-like figure with a long nose fighting a child which appears to cling to its mother. The form on the left seems to be a kind of boat reflected in water, but the connection with the rest of the design is unclear. Again the style suggests an early date. An inscription on the verso tells us that the drawing belonged to the well-known Blake collection of Henry Cunliffe from whose sale it was bought by Keppel and subsequently given to the Museum by David Keppel in 1914. According to Martin Butlin the drawing passed with others from Mrs. Blake to Frederick Tatham, and it was in lot 170 at his sale on 29 April 1862, where it was bought with five others for 14/-by Toovey for Henry Cunliffe. 3 W. Blake, Goliath cursing David, watercolor. Courtesy Museum of Fine Art, Boston. 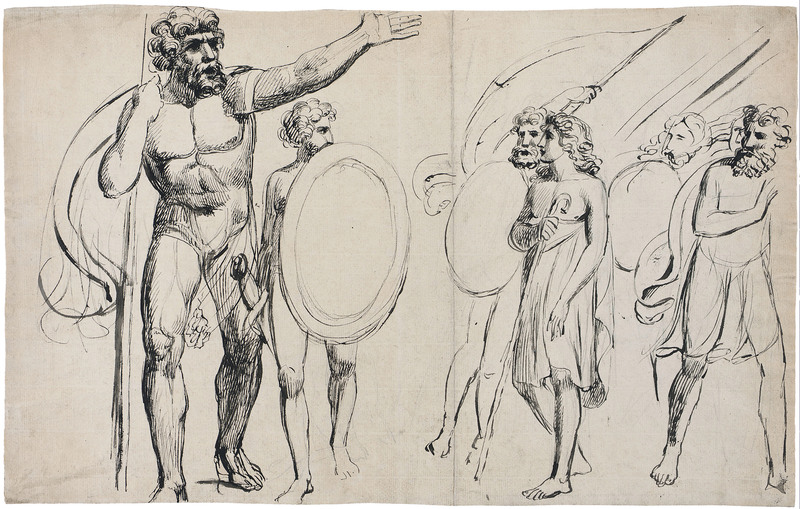 enjoy their individuality of handling, but it must be admitted that they are rather crude if compared to those of his contemporaries like Stothard and Flaxman. Although Blake was not an autodidact, the originality of the motifs tends to outstrip his mechanical abilities, which were evidently not finely honed by constant drawing from the model. 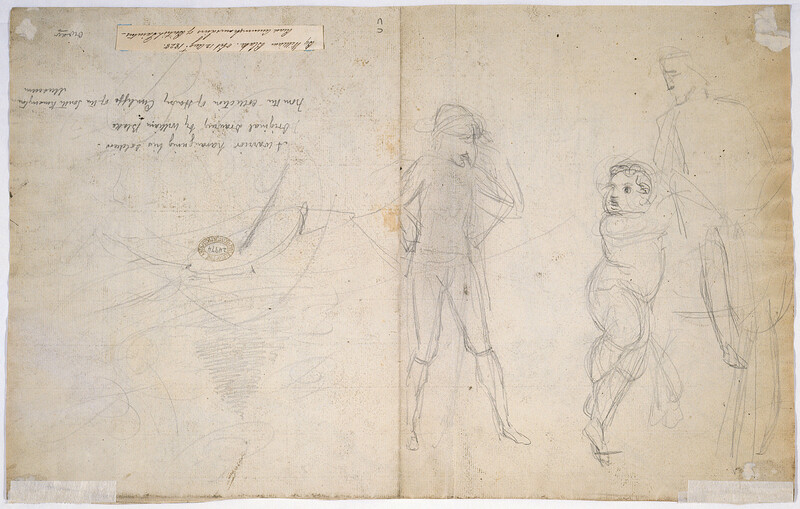 As a result there are often embarrassing defects in Blake’s early drawings which have led connoisseurs to dismiss them as inferior examples by one of the many unidentified English Neoclassical artists of the late eighteenth century. No doubt they will continue to turn up in odd places, and we might well find among them more early prototypes for mature compositions.